ATLANTA (March 14, 2016) – Chick-fil-A® introduces its newest menu item, Spicy Southwest Salad, at restaurants nationwide today. 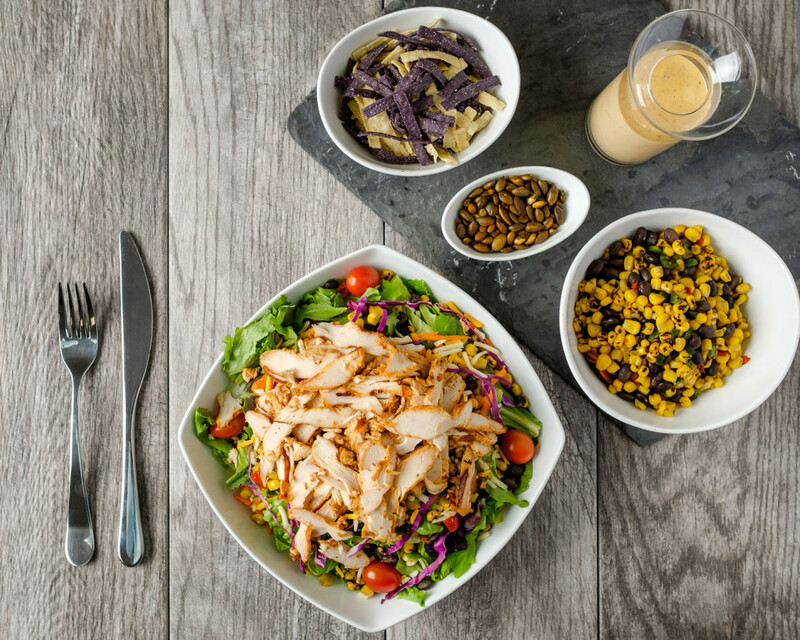 The entrée salad, which is prepared fresh in Chick-fil-A’s 2,000 restaurants daily, includes spicy grilled chicken, zesty roasted corn and black beans. It is served with shredded red cabbage and carrots, grape tomatoes and a blend of Monterey Jack and cheddar cheeses, and topped with seasoned tortilla strips and chili lime pepitas (pumpkin seeds). The Spicy Southwest Salad is a reboot of the former beloved Southwest Chargrilled Salad. Two brand new dressings will also be available to pair with the new salad: Creamy Salsa Dressing and Chili Lime Vinaigrette. The salad contains just 260 calories before extra toppings or dressing. The Spicy Southwest Salad, which was tested in restaurants in Orlando and Houston, is a permanent menu addition and will replace Chick-fil-A’s Asian Salad. It will be priced comparably with Chick-fil-A’s other salad options, starting at $7.05. Another new menu item making its debut nationwide today, Frosted Coffee, is being introduced following the successful launch of Frosted Lemonade in 2015. Frosted Coffee combines Chick-fil-A’s signature vanilla Icedream® with THRIVE Farmers cold-brewed iced coffee. The refreshing new treat starts at just 240 calories, making it perfect for customers seeking an on-the-go treat with fewer than half the calories of a milkshake. A limited-time menu option, Frosted Coffee will be available through May 31, 2016. For more information about Chick-fil-A and stories about the company’s food, people and customers across the country, visit the News section of thechickenwire.chick-fil-a.com. Atlanta-based Chick-fil-A, Inc. is a family owned and privately held restaurant company founded in 1964 by S. Truett Cathy. Devoted to serving the local communities in which its franchised restaurants operate, and known for its original chicken sandwich, Chick-fil-A serves freshly prepared food in more than 2,000 restaurants in 42 states and Washington, D.C.
Chick-fil-A system sales exceeded $6 billion in 2015, which marks 48 consecutive years of sales growth. Chick-fil-A ranked first for customer satisfaction in the Limited Service Restaurants industry according to the 2015 American Customer Satisfaction Index and received the highest ACSI score ever in the industry. The company was also recognized in 2015 as America’s “Top Chicken Restaurant Brand” by The Harris Poll and the only restaurant brand named to the Top 10 “Best Companies to Work For” by 24/7 Wall Street. More information on Chick-fil-A is available on the chain’s website located at www.chick-fil-a.com. Culinary maven Julia Child once said, “The perfect dressing is essential to the perfect salad.” We couldn’t agree more. Through years of testing, countless pounds of lettuce, and numerous dressing recipes, we’ve landed on the perfect pairing of Chick-fil-A salads and dressings. What’s Your Favorite Chick-fil-A Menu Item? The list of our most popular menu items may come as a surprise. While we’re best-known for the Original Chicken Sandwich (and it’s the most popular sandwich on the menu), its savory sidekick, Waffle Fries, take the crown for the most ordered item on the menu.